Control of the hierarchical self-assembly of polyoxometalate-based metallomacrocycles by redox trigger and solvent composition. Piot, M. ; Abécassis, B. ; Brouri, D. ; Troufflard, C. ; Proust, A. ; Izzet, G.
Proc. Natl. Acad. Sci. U. S. A., 2018, 36, 8895-8900. Black, F. A. ; Jacquart, A. ; Toupalas, G. ; Alves, S. ; Proust, A. ; Clark, I. P. ; Gibson, E. A. ; Izzet, G.
Chem. Sci., 2018, 9, 5578-5584. 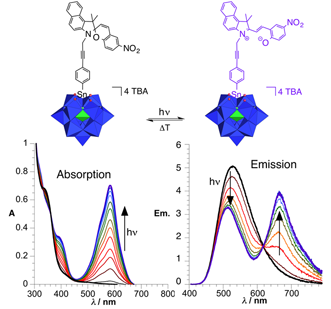 Photochromism and Dual-Color Fluorescence in a Polyoxometalate–Benzospiropyran Molecular Switch. Parrot, A. ; Bernard, A. ; Jacquart, A. ; Serapian, S. A. ; Bo, C. ; Derat, E. ; Oms, O. ; Dolbecq, A. ; Proust, A. ; Métivier, R. ; Mialane, P. ; Izzet, G.
Angew. Chem. Int. Ed., 2017, 56, 4872–4876. Hierarchical Self-Assembly of Polyoxometalate-Based Hybrids Driven by Metal Coordination and Electrostatic Interactions : From Discrete Supramolecular Species to Dense Monodisperse Nanoparticles. Izzet, G. ; Abécassis, B. ; Brouri, D. ; Piot, M. ; Matt, B. ; Serapian, S. A. ; Bo, C. ; Proust, A.
J. Am. Chem. Soc., 2016, 138, 5093-5099. Charge transfer interactions in self-assembled single walled carbon nanotubes/Dawson–Wells polyoxometalate hybrids. Bosch-Navarro, C. ; Matt, B. ; Izzet, G. ; Romero-Nieto, C ; Dirian, K. ; Raya, A. ; Molina, S. I. ; Proust, A ; Guldi, D. M. ; Martí-Gastaldo, C. ; Coronado, E.
Chem. Sci., 2014, 5, 4346-4354. Charge photo-accumulation and photocatalytic hydrogen evolution under visible light at an iridium(III)-photosensitized polyoxotungstate. Matt, B. ; Fize, J. ; Moussa, J. ; Amouri, H. ; Pereira, A. ; Artero, V. ; Izzet G. ; Proust, A. Energy Environ. Sci., 2013, 6, 1504-1508. Functionalization and post-functionalization a step towards polyoxometalate-based materials. Chem. Soc. Rev., 2012, 41, 7605–7622. Cyclodextrin-Induced Auto-healing of Hybrid Polyoxometalates. Izzet, G. ; Ménand, M. ; Matt, B. ; Renaudineau, S. ; Chamoreau, L.-M. ; Sollogoub, M. ; Proust, A., Angew. Chem. Int. Ed., 2012, 51, 487-490. Rapid Energy Transfer in Cascade-Type Bodipy Dyes. Harriman, A. ; Izzet, G. ; Ziessel, R.
J. Am. Chem. Soc, 2006, 128, 10868-10875. Calixtren and Cu(II) : a new generation of funnel complexes on the way to calix-zymes. Proc. Natl. Acad. Sci. U.S.A., 2005, 102, 6831-6836.